Out of all of Athens' ancient ruins, the Agora firmly defines the city’s status as the cradle of Western civilization. 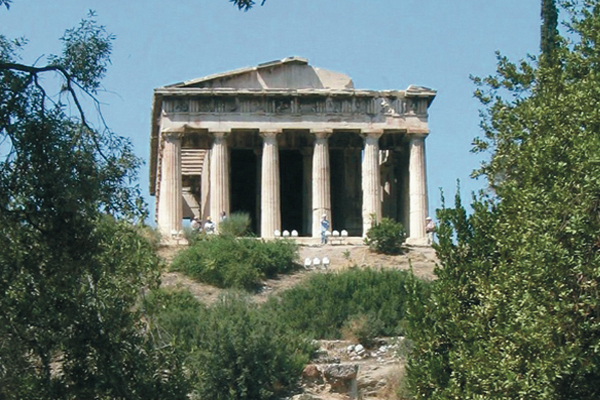 This was where ancient Greek democracy came to life. It was a commercial, political, religious, and cultural hub where the greatest Greeks such as Plato, Socrates, Demosthenes, e.t.c. theorized, spoke out and debated. Explore the temples, an ancient concert hall and imagine ancient life under its famous long, marble colonnaded arcades. You’ll also see the significant artifacts at the Agora Museum, located in the two-storied Stoa of Attalos which was built in the 2nd century BC. The tour ends at the Ancient Agora. 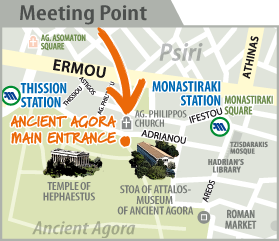 Your guide, holding an orange Athens Walking Tours sign, will meet you outside the main entrance of the archaeological site of the Ancient Agora, situated on Adrianou str., opposite St. Philippos Greek Orthodox Church. View map here. This tour is a continuation of the Athens City Tour & Acropolis tour which starts earlier and the guide will meet you, together with the rest of his/her group 5 minutes prior to start time of the tour. Our guides are holding an orange colored Athens Walking Tours sign.